Two days ago I blogged about the Dangers of the Sea. Looking through some pictures today I found a fitting image to illustrate it: The wreck of the Wyre Majestic. The Majestic was a fishing trawler of the large fleet of Wyre Trawlers. 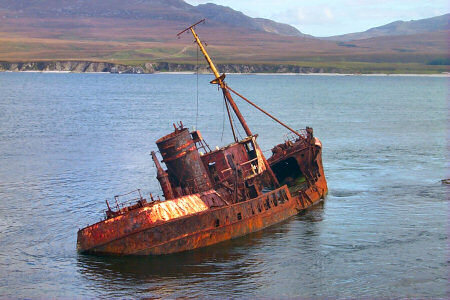 It ran aground at Rubh'a'Mhill on the southern end of Bunnahabhain Bay, Sound of Islay. Various attempts were undertaken to pull it off the rocks, but they were unsuccessful. The Bosun's Watch! The Fleetwood motor trawler Wyre Majestic. And I hope it shouldn't be too difficult to guess which whisky I'm drinking while writing this entry?